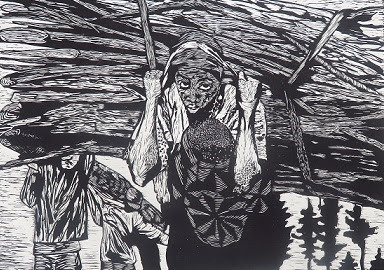 The Suffering of the People opens in the Schreiner Gallery of the Tatham Art Gallery in Pietermaritzburg on March 31, 2019. The opening takes place at 11h00 and the Opening Speaker will be Dr Kathy Arbuckle. Siyabonga Ngubane is a young artist who is passionate about making linoprints. He draws directly onto the lino and then carves out intricate designs in different textures. He is a quiet person who thinks deeply about life, and is interested in people and their reactions. He is also grateful to his mother and grandmother who taught him good values in life. They both are deeply religious supporters of the Christian faith. However, Siyabonga is tolerant of all religions. Other religious groups, such as Muslims, Zionist, Shembe, Buddhist etc, are also represented in his works. In 2018, Ngubane completed an honours course in printmaking at the Centre for Visual Art at the University of KwaZulu-Natal in Pietermaritzburg. He will be Artist-In-Residence from April 9 to 12 at the Tatham.